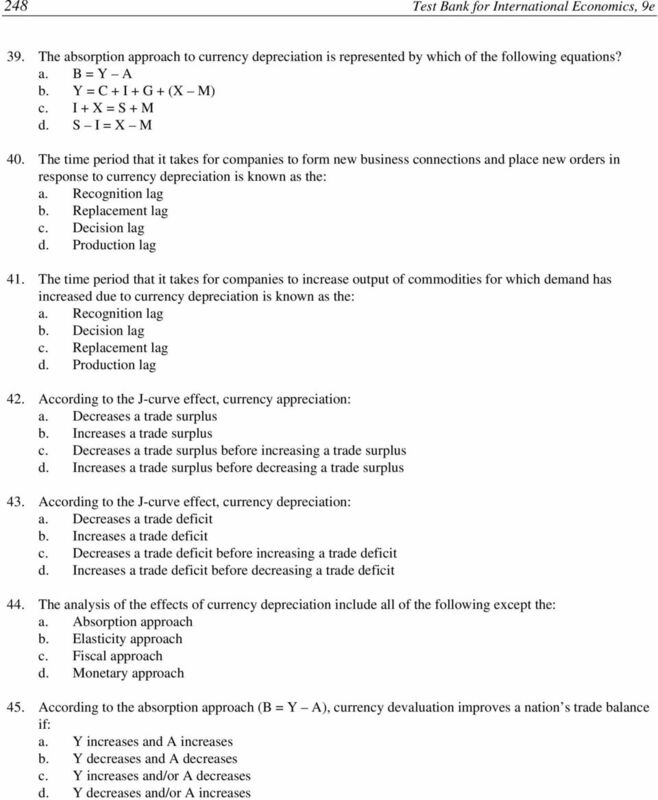 Download "CHAPTER 15 EXCHANGE-RATE ADJUSTMENTS AND THE BALANCE OF PAYMENTS"
9 250 Test Bank for International Economics, 9e 50. Refer to Table Assume that Toyota Inc. obtains all of its automobile inputs from Japanese suppliers. If the yen s exchange value appreciates from 200 yen = $1 to 100 yen = $1, the dollar-equivalent cost of a Toyota automobile equals: a. $10,000 b. $20,000 c. $30,000 d. $40, Refer to Table Assume that Toyota Inc. imports steel from U.S. suppliers, whose costs are denominated in dollars, while all other inputs are obtained from Japanese suppliers whose costs are denominated in yen. If the yen s exchange value appreciates from 200 yen = $1 to 100 yen = $1, the yen cost of a Toyota automobile equals: a. 2,400,000 yen b. 3,000,000 yen c. 3,600,000 yen d. 4,200,000 yen 52. 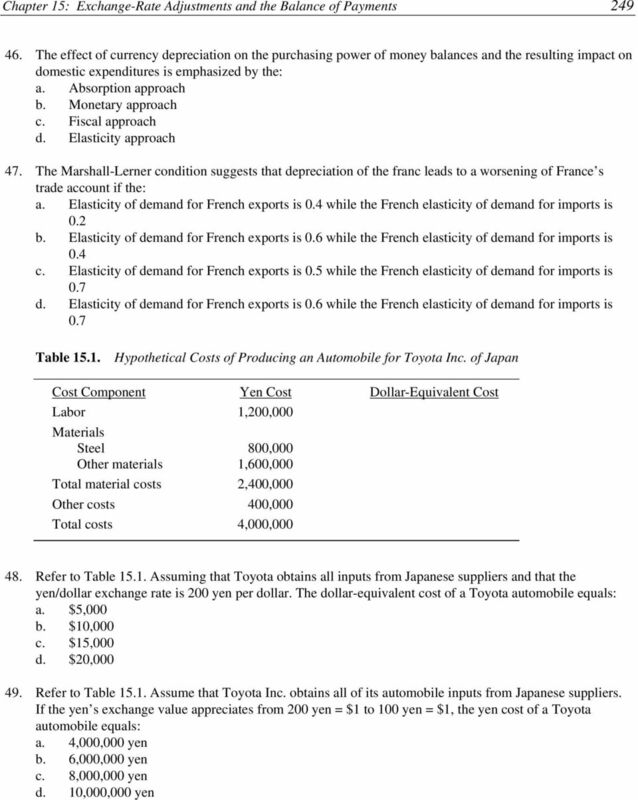 Refer to Table Assume that Toyota Inc. imports steel from U.S. suppliers, whose costs are denominated in dollars, while all other inputs are obtained from Japanese suppliers whose costs are denominated in yen. If the yen s exchange value appreciates from 200 yen = $1 to 100 yen = $1, the dollarequivalent cost of a Toyota automobile equals: a. $24,000 b. 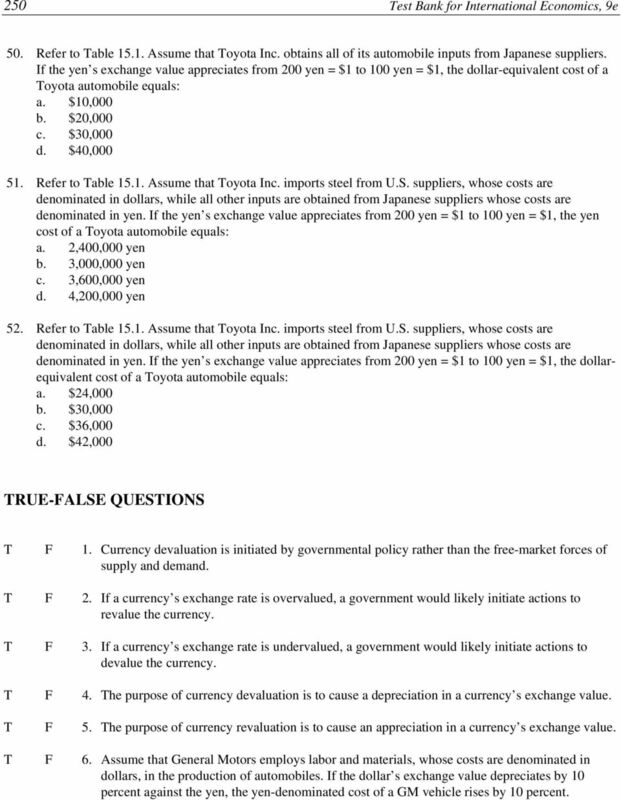 $30,000 c. $36,000 d. $42,000 TRUE-FALSE QUESTIONS T F 1. Currency devaluation is initiated by governmental policy rather than the free-market forces of supply and demand. T F 2. If a currency s exchange rate is overvalued, a government would likely initiate actions to revalue the currency. T F 3. If a currency s exchange rate is undervalued, a government would likely initiate actions to devalue the currency. T F 4. The purpose of currency devaluation is to cause a depreciation in a currency s exchange value. T F 5. The purpose of currency revaluation is to cause an appreciation in a currency s exchange value. T F 6. Assume that General Motors employs labor and materials, whose costs are denominated in dollars, in the production of automobiles. If the dollar s exchange value depreciates by 10 percent against the yen, the yen-denominated cost of a GM vehicle rises by 10 percent. 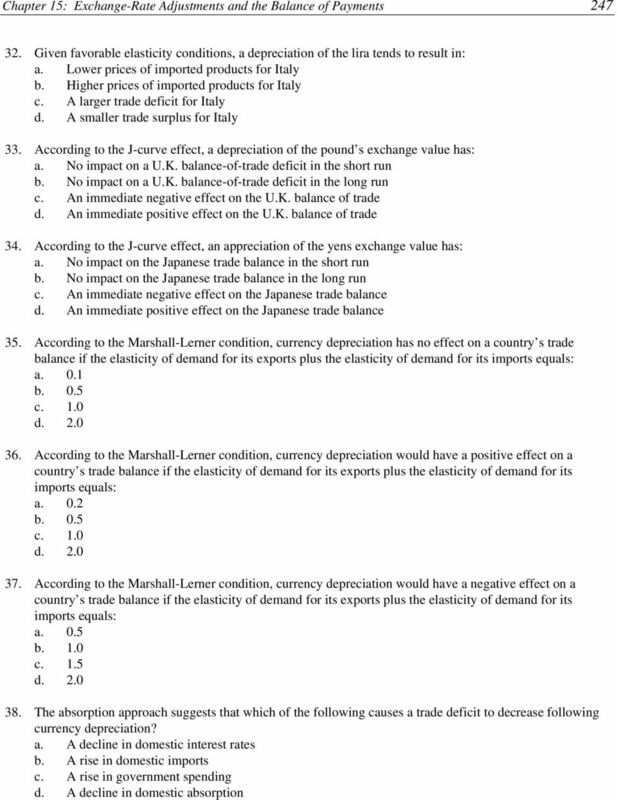 10 Chapter 15: Exchange-Rate Adjustments and the Balance of Payments 251 T F 7. Assume that General Motors employs labor and materials, whose costs are denominated in dollars, in the production of automobiles. If the dollar s exchange value appreciates by 10 percent against the yen, the yen-denominated cost of a GM vehicle falls by 10 percent. T F 8. Appreciation of the dollar s exchange value worsens the international competitiveness of Boeing Inc., whereas a dollar depreciation improves its international competitiveness. T F 9. When manufacturing automobiles, suppose that General Motors uses labor and materials whose costs are denominated in dollars and pounds respectively. If the dollar s exchange value appreciates by 15 percent against the pound, the pound-denominated cost of a GM vehicle rises by 15 percent. T F 10. According to the absorption approach, currency devaluation best improves a country s trade balance when its economy is at maximum capacity. T F 11. When manufacturing computer software, suppose that Microsoft Inc. uses labor and materials whose costs are denominated in dollars and francs respectively. If the dollar s exchange value depreciates 10 percent against the franc, the franc-denominated cost of the firm s software falls by 10 percent. T F 12. When producing jetliners, suppose that Boeing employs labor and materials whose costs are denominated in dollars and marks respectively. If the dollar s exchange value depreciates 20 percent against the mark, the mark-denominated cost of a Boeing jetliner falls by an amount less than 20 percent. T F 13. As yen-denominated costs become a larger portion of Ford s total costs, a dollar appreciation results in a smaller increase in the yen-denominated cost of a Ford auto than occurs when all input costs are dollar denominated. T F 14. A depreciation of the dollar results in Whirlpool dishwashers becoming less competitive in Europe. T F 15. By decreasing the relative production costs of U.S. companies, a dollar appreciation tends to lower U.S. export prices in foreign-currency terms, which induces an increase in the amount of U.S. goods exported abroad. T F 16. By increasing relative U.S. production costs, a dollar depreciation tends to increase U.S. export prices in foreign-currency terms, which results in an increase in the quantity of U.S. goods exported abroad. T F 17. Suppose the exchange value of the franc rises against the currencies of Switzerland s major trading partners. To protect themselves from decreases in foreign sales caused by the mark s appreciation, Swiss companies could shift production to countries whose currencies had depreciated against the mark. T F 18. In the early 1990s, the yen sharply appreciated against the dollar. To protect themselves from export reductions caused by the yen s appreciation, Japanese auto companies transferred increasing amounts of auto production from the United States to Japan. 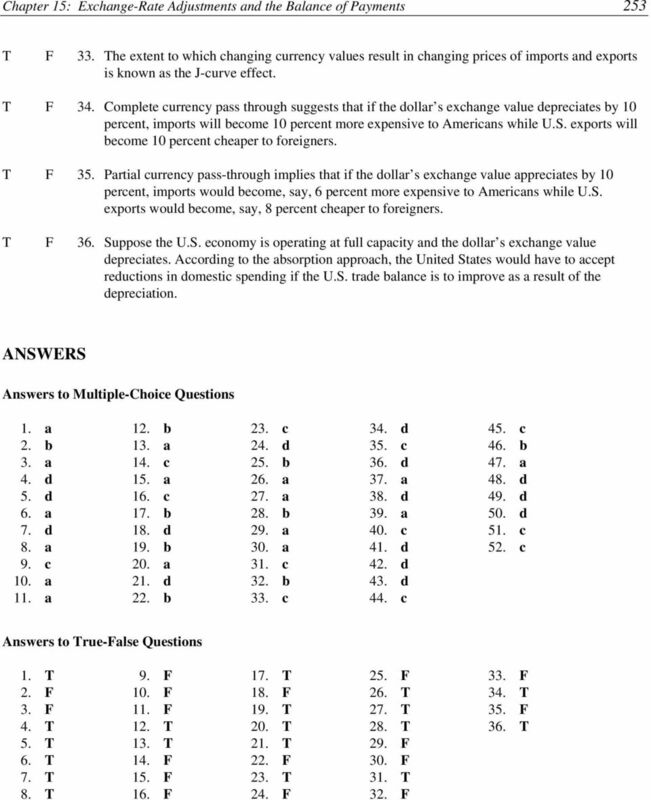 11 252 Test Bank for International Economics, 9e T F 19. The elasticity approach to currency depreciation emphasizes the income effects of depreciation. T F 20. The elasticity approach to currency depreciation emphasizes the relative price effects of depreciation and suggests that depreciation best improves a country s trade balance when the elasticities of demand for the country s imports and exports are high. T F 21. The absorption approach to currency devaluation deals with the income effects of devaluation while the elasticity approach to devaluation deals with the price effects of devaluation. T F 22. According to the absorption approach, an increase in domestic expenditures must occur for currency devaluation to promote balance of trade equilibrium. T F 23. The monetary approach emphasizes the effects of currency depreciation on the purchasing power of money, and the resulting impact on domestic expenditure levels. T F 24. According to the Marshall-Lerner condition, currency depreciation will worsen a country s balance of trade if the country s elasticity of demand for imports plus the foreign demand elasticity for the country s exports exceeds 1.0. T F 25. 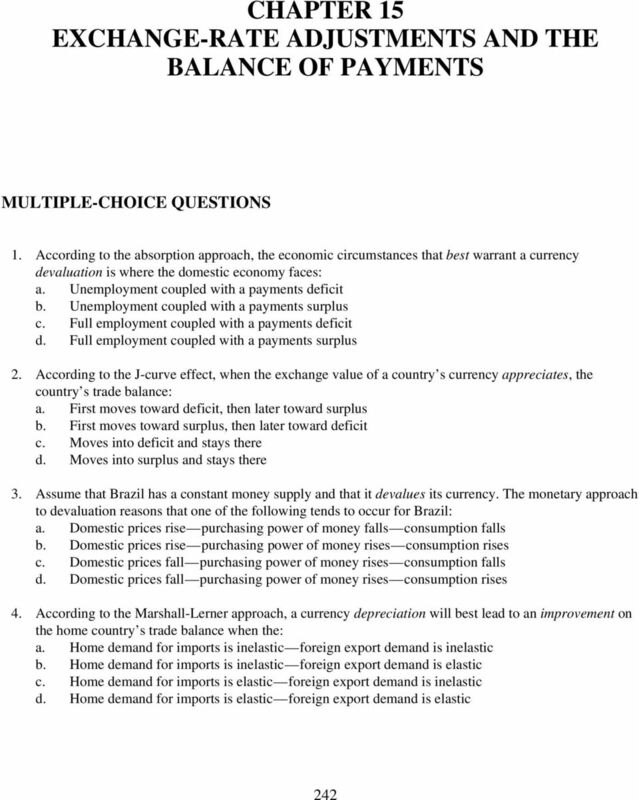 The Marshall-Lerner condition asserts that if the sum of a country s elasticity of demand for imports and the foreign elasticity of demand for the country s exports equals 1.0, a depreciation of the country s currency will not affect its balance of trade. T F 26. Suppose the U.S. price elasticity of demand for imports equals 0.4 and the foreign demand elasticity for the U.S. exports equals 0.2. 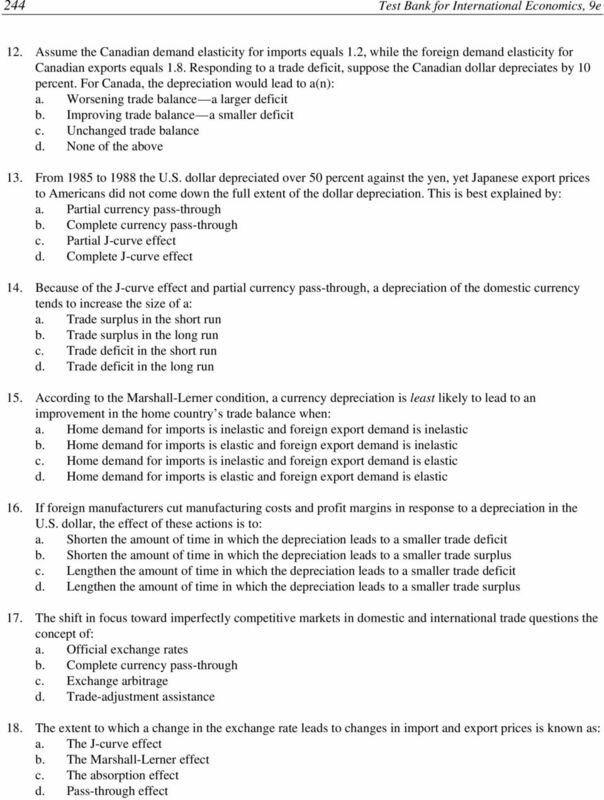 According to the Marshall-Lerner condition, a depreciation of the dollar s exchange value will improve the U.S. balance of trade. T F 27. 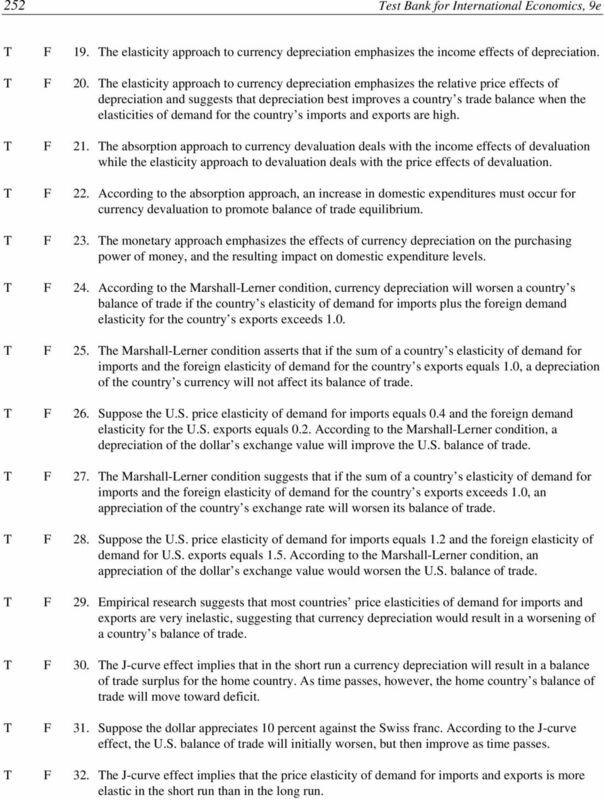 The Marshall-Lerner condition suggests that if the sum of a country s elasticity of demand for imports and the foreign elasticity of demand for the country s exports exceeds 1.0, an appreciation of the country s exchange rate will worsen its balance of trade. T F 28. Suppose the U.S. price elasticity of demand for imports equals 1.2 and the foreign elasticity of demand for U.S. exports equals 1.5. 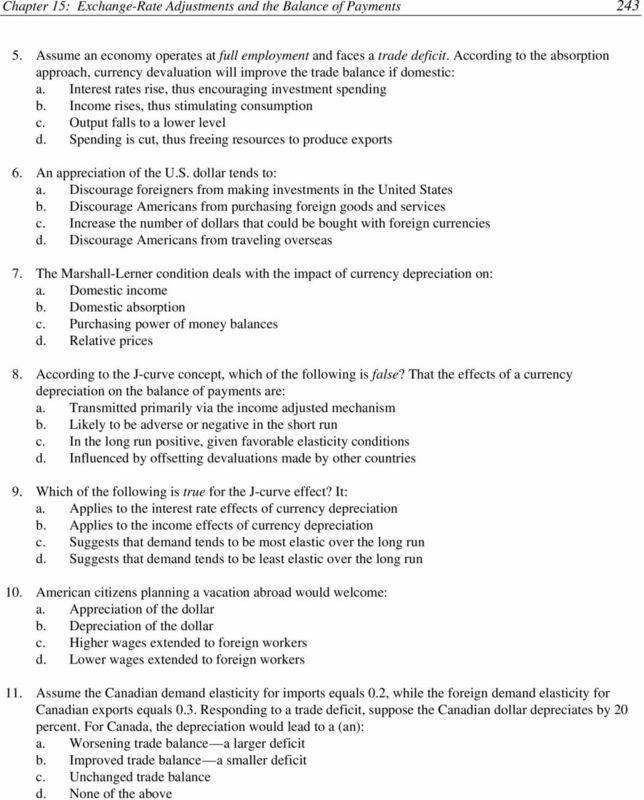 According to the Marshall-Lerner condition, an appreciation of the dollar s exchange value would worsen the U.S. balance of trade. T F 29. Empirical research suggests that most countries price elasticities of demand for imports and exports are very inelastic, suggesting that currency depreciation would result in a worsening of a country s balance of trade. T F 30. The J-curve effect implies that in the short run a currency depreciation will result in a balance of trade surplus for the home country. As time passes, however, the home country s balance of trade will move toward deficit. T F 31. Suppose the dollar appreciates 10 percent against the Swiss franc. According to the J-curve effect, the U.S. balance of trade will initially worsen, but then improve as time passes. T F 32. The J-curve effect implies that the price elasticity of demand for imports and exports is more elastic in the short run than in the long run. Can a Depreciation of Dollar Close US Trade Deficit? sgch17-18 Name: Class: Date: Multiple Choice Identify the letter of the choice that best completes the statement or answers the question. Name: Class: Date: sgch17-18 Multiple Choice Identify the letter of the choice that best completes the statement or answers the question. 1. There was hyperinflation a. during 1880-1896 in the United States.